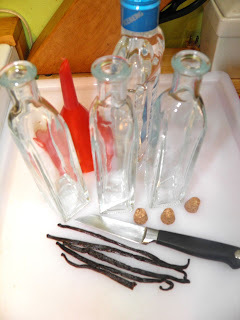 This is someone else's homemade vanilla extract. I have run out completely. Boring. Plain. Unexciting. Vanilla. They're all words cast around as meaning about the same thing. That's too bad, because there's nothing boring about vanilla. In fact, vanilla is one of the most complex flavourings we use in food. It's also the second most expensive – right after saffron. AND the most popular by far. 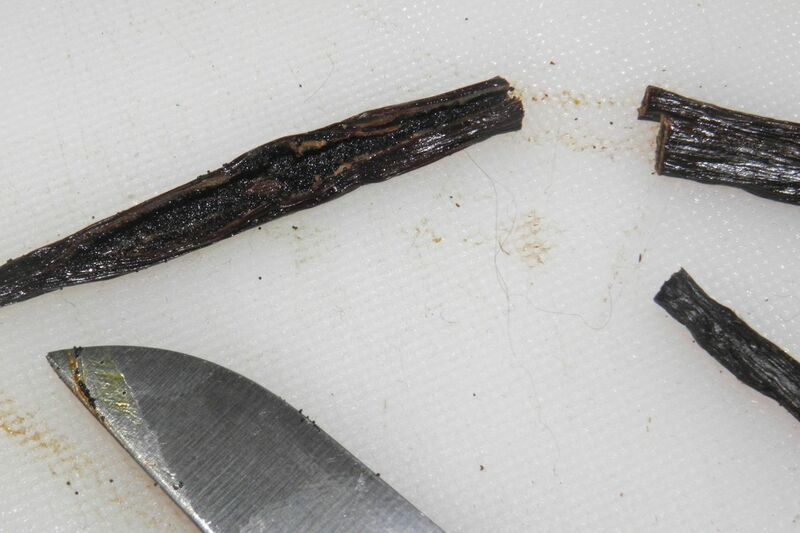 This is all you need to make your own vanilla. This is a recipe that not only saves you money but also is head and shoulders above artificial vanilla extract. Throw that stuff out, please! 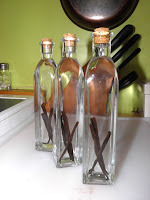 Has anyone recently bought a bottle of real vanilla extract? Bit of a burden on the wallet, especially if you bake a fair bit. So it's good to be able to make it at home. This recipe is EASY. It is so easy that it essentially makes itself without any outside intervention. Unfortunately it’s also one of those recipes that you have to wait, and wait, for the results. So how do you do it? 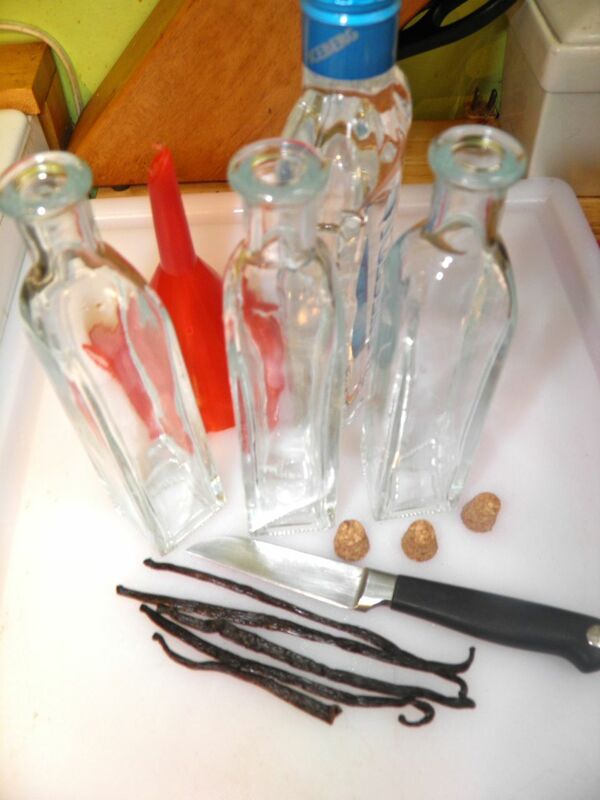 All you need are vanilla beans, vodka, small bottles and a knife. I found small corked bottles at Michael’s arts and crafts for $1.69 each. They are perfect. In case you don’t already know, vanilla beans (the origin of “real” extract) are the seed pods of the orchid Vanilla planifolia. Mesoamerican peoples cultivated the vanilla orchid, but it wasn’t called vanilla until the Spanish arrived. Their word “vainilla” means "little pod." Cortés is credited with introducing Europe to both vanilla and chocolate. At least we owe him for that. We usually purchase vanilla extract here in Nova Scotia for about $15+ per 4 ounces (110 ml). Since we’re making a whopping 375 ml supply to compare cost multiply that by three to $45 CAN. as "dirt" on the cutting board. They're very small. 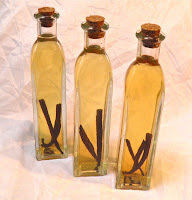 This recipe (375 ml of vanilla extract) costs about $28 for the whole lot, including the bottles. The big variable is in the price of the vanilla beans. They’re (relatively) cheap at our local Bulk Barn bulk food stores and every bit as good as more expensive gourmet stores. My bottom photo shows the extract right after 24 hours. About 5 hours after I made it I could see a little colour coming into the bottles. Last time I made it the extract had coloured quite darkly by about 3 months and was able to be used. This is right after combining. Cut each vanilla bean in half. Split the vanilla beans down lengthwise and peel back to expose the seeds. Add 1 and 1/2 beans to each small bottle. Pour 1/2 cup vodka over the beans, cork and wait. It will be perfectly clear at first, but at 1 week you will begin to see some colour. After 12 hours I could see some colour in mine. At 1 month your extract will be usable but weak. At 3 months it will be very good. At 6 months it will be amazing. It will continue to darken as it ages. 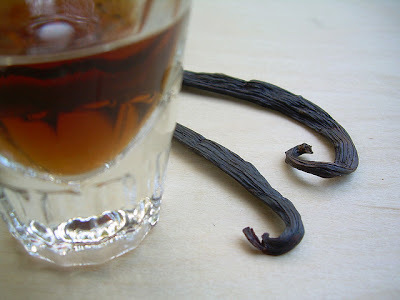 I have read that you can keep your vanilla going by topping up with more vodka as you use it and exchange the beans as they get exhausted. If you do it now, you’ll be ready to bake in May. I know it’s a while, but it will be here before we know it. I’m sure. * Of course you can scale this recipe up or down. The ratio is 1.5 beans to 1/2 cup (118 ml) of vodka.